James...'s review"Mismarketed but great guitar"
It's also worth mentioning that these are technically hollowbody guitars, which seems to be something a lot of people miss when they buy these. A quick note about this. Most Les Pauls are chambered or weight relieved which is totally different from being a hollowbody, which the Supreme is. 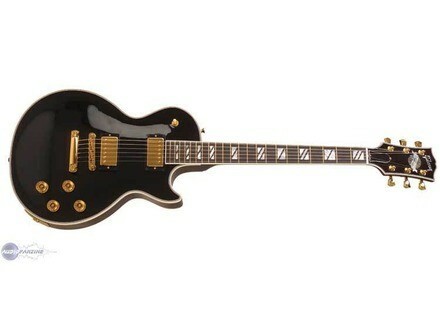 That, along with different inlays and tuners and a 50's neck is what set this apart from it's cousin the Les Paul Custom. I have smaller hands and the neck is sort of a love hate thing for me. It can be awkward for certain chords but on the bright side, my hand rarely gets tired after 3 hours of playing like on some smaller necks. Overall I'm fine with it. This is a lighter guitar than it looks due to the hollow construction. It's a little thicker than your normal Les Paul. Feels more like you're playing a jazz body to be honest. Other than that it's pretty familiar. Controls are the same. Tuners are solid. I think this guitar gets a bad rep because players buy it expecting a suped up Les Paul Custom. It's not that kind of guitar. This is in truth more like an ES175 than anything. It's a jazz guitar. Super resonant and prone to feedback just like any hollowbody, you have to be mindful of a guitar's construction and what that means. Gibson picked the wrong pickups for this guitar. It sounds monumentally better with 57 classics than the very non complimentary set they put in it. Unfortunately due to the design it's very hard to change pickups although not impossible. I use it to play at church. It's very resonant and kind of heavenly sounding so it works great for that. This is not a guitar for hard rock. A lot of guys get that idea and it has resulted in some bad rep for the Supreme. I really love mine and considering the luxury features the high price actually makes sense. I can imagine these are pretty expensive to make. Gibson should really put some different pickups in these...I don't know what they were thinking. Also the headstock is a bit ugly. I have a lot of people come to me asking what model this is because it's a rarity and oddity to most. Still it's a fine guitar when used for the proper style. The Gibson Les Paul guitar is not flashy guitar and certainly not some sort of boutique guitar. Sometimes when they have the quilted or flamed maple tops they can get really gorgeous and exotic looking. But overall these guitars are meant to be played and meant to be used. But not really showroom pieces and collectors items really guitars are meant for the active and professional musicians. If a great time to great feel and overall and extremely versatile guitar. I really like the tone of these guitars with high gain amplifier in mind. Preferably I'd choose Marshall amplifier's because it seems to be just a great classic connection between this guitar and those amplifiers. It must be the voicing or just the overall chemistry of the two pieces of gear when they unite together. But they sounds so great together that it's very addicting tone to have on hand. The overall feeling I get when playing a Marshal or a high gain amp with a Les Paul is almost instant gratification. It is so smooth and full of tone that is almost impossible to put down. You can find these guitars for right around $1899 in most guitar shops and online retailers. These are very cool guitars for the moment and a much improved step up from eh Studio models of the Gibson Les Paul guitars. I would recommended this guitar o anyone who doesn't need the cool flamed maple tops and still wants a rocking guitar without paying the Custom LP prices. tjon901's review"When a Les Paul Custom is not good enough"
The Supreme models were a set of models Gibson made that were placed above their Custom level guitars. Now only one model remains in the Supreme line and it is the Les Paul Supreme. This guitar has some crazy features no other Les Paul has but then it has some antiquated features Gibson should have changed decades ago. The most noticable feature is the AAAA figured maple top on this guitar. It is really beautiful and has a really deep look to it. The guitar is your standard Les Paul shape. It has a mahogany body and a fat mahogany neck with an ebony fretboard. The fretboard has 22 frets and has split block inlays I dont think Gibson puts on any other guitar. The pickups in this guitar are a pretty strange choice. The SG Supreme I am comparing this to came with Classic 57s while this guitar has a 490R in the neck and a 498T in the bridge. I dont know why they would put seemingly worse pickups in the Les Paul Supreme I was expecting them to have similar electronics and its not like you can easily upgrade the pickups on the Les Paul Supreme like you can on the SG Supreme the Les Paul Supreme has no control cavity plate cover. It has a guady Gibson globe Logo on the headstock instead of the split diamond and a gold truss rod cover. It has non locking Grover Tuners on the headstock also with a standard tune-o-matic as the bridge. You can really see that Gibson put form over function with this guitar. To show off the fancy wood they used for the tops and back of the guitar they did not put a control cavity plate on the back. If you are to do any modifications of the inside of the guitar you will have to do it all through the jack plate. I hope you have small hands. The neck on this guitar is pretty fat so you will have to get use to it if you are more accustom to guitars with more modern neck shapes. The tuners are non locking and the bridge is non locking which is more of a gripe for me. With standard tune-o-matic bridges when you are changing strings or working on the guitar the bridge can fall off when it doesnt have string tension. This can easily mess up your intonation making the guitar sound off. There are no straplocks either so be careful if you play this guitar standing up. These are things I would upgrade immediately but I should need immediate upgrades on a guitar that cost 5000 dollars. There are 600 dollar ESP's and Epiphones that have these features why cant Gibson put them on a 5000 dollar guitar. This guitar cost 2000 dollars top to produce a set of 10 dollar tuners are not going to hurt Gibson. I dont know who would have picked these pickups for this guitar. I think Classic 57s would have worked better all around. The 498T is a pretty hot pickup to be in a classy Gibson like this. I think the output is around 13k. This is pushing into heavy metal output territory. This is a far cry from the smooth tones you would get with a PAF or something similar. The neck position 490 is overly dark and muddy. You can not get any clarity with the neck position on this guitar unless you crank on the tone knob. Normally a set of lousy stock pickups isnt much of a problem but with this guitar you have no real choice unless you are an expert luthier use to working on hollowbody guitars. This guitar has no control cavity cover plate. So any internal work you do on this guitar has to be done through the input jack plate which is about 2 inches by 1. I think this guitar is more of a collectors piece than a real player. This guitar has less features than a standard Les Paul and tries to make up for them by looking pretty. Pretty wood does not equal good tone all it equals is pretty wood and theft target. If you have the bread and are considering a Les Paul Supreme I would strongly recommend you try out a standard Les Paul Custom first. The Custom is a time tested design and sounds good and is more of a player than this guitar. The Supreme is just a pretty face. This cant be said of the SG Supreme which has the pretty face and all the playability of a normal SG. Hatsubai's review"Crazy good looking...and crazy expensive"
The Les Paul Supreme was a model that Gibson released to really show off what they can do. While the outside looks the same, it's actually a bit different. It still has a mahogany body, high quality flame maple top, set mahogany neck, ebony fretboard, 22 frets (gold colored), two humbuckers, two volume knobs, two tone knobs, a three way switch and a TOM hard tail bridge. The biggest and most significant feature would be the chambering in this guitar. The guitar is absolutely gorgeous, and the flame on this thing is sick. The new inlays help show off that it's a bit different than your standard Les Paul, as well as the gold frets. The back on this is actually curved or beveled, so it feels a little different in your lap when playing it. It also has no control cavity on the back; it's a gorgeous piece of flame maple. The neck on this is your standard Les Paul neck, and the gold hardware on this really makes the guitar pop. Aside from that, the 12'' radius is also great for lower action and greater bending without fretting out. Given that it's chambered, this guitar will sound different from other Les Pauls. It seems to have a softer top end and a looser bottom end that may or may not be pleasing to your ears. One thing that really gripes me is that there's no rear cavity due to the chambering. Because of that, replacing the pickups is ridiculously hard. Since I'm not a fan of the standard pickups, this is an issue for me. However, most people seem to generally enjoy the standard Gibson pickups, so it shouldn't be too much of an issue for most people. The Les Paul Supreme is quite different from the other Les Pauls out there, and it costs a ton of money. It's hard to recommend for most standard guitar players, but if you're looking for one of the most elegant looking Les Pauls ever released on the market, this is the guitar you want to check out. Keep in mind that this has no control cavity, so replacing pickups will be a huge pain. MGR/Ecrup Uamak's review"Gibson Les Paul Supreme"
I bought this unit at a guitar center in town. I thought it looked appealing and semed to ask me to buy it. So I went ahead and shelled out $850. The construction is solid and sturdy. When i first bought the unit it was nice and shinny, but after playing it its become a little worn. I thought this was a great guitar for all levels of playing and the Humbuckers give out an amazing sound. niavlys's review (This content has been automatically translated from French)" The Supreme Happiness"
Supreme LP 2010. Everything was (good) said on its Specifications. But what it is beeeellle! The neck is thin (yes). The ergonmie is very nice, it weighs not a ton. The pickups are wonderful 490/498 families. Brief Bonamassa Maiden, through that Bonns things. j4343's review (This content has been automatically translated from French)" attention to false"
I preferred to buy in the U.S. so as to be on the guitar has not been disturbed by a dealer benevolent but who can not necessarily do so. I found a site where large dealer Gibson mentioned the weight of the instrument (my concern LP) and detailed photos of the model sold, I had more chances to buy a guitar straight from the oven! WARNING! The key is believed ebony is RichLite, composite utlise also Martin for some keys, although the descriptions of the dealers say it's ebony. The 2006 that made me want to buy mine was also RichLite. Side settings, I would have preferred an overall volume control instead of two individual, it's the same for all Les Paul, but it can change. Difficult to do on the Supreme because it must pass through the plate jack! This is a Les Paul, but supreme. The average weight 9livres LP, but some 7.2 or 10livres. You want to play that goes with the sound of the guitar, and as a wide range is available, you can not stop. What surprised me most is the side without acoustic amp, which allows working unplug. Connected, plain neck pickup or both, it is a LP with more body, its close on Larry Carlton's 335. For big sound no surprise, it sends very strong. The LP that I had, luxury 68, 25/50 anniversary, custom shop85 Standard is the most versatile. For over fifty years since I played, I just tried everything. I still have a couple of guitars, but the Supreme does not duplicate in the park. The icing on the cake is that you can work without the plug. With experience, I make this choice without hesitation. frankly everything bf t say I regret only one thing is not having an appropriate level to benefit because it offers a game and a fantastic sound. To me the course !!!!!!!!!! very nice light guitar and I think it sounds anything but it sounds as good on my config is a marvel. Too bad I did not that was recording the album. In addition it is a gift from my future wife that I was offered as a ring which she has taste? for me biensur !!!!!!!!!!!!!!!! !.